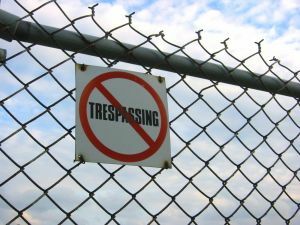 There are numerous different types of trespass violations under Maryland law. If a cop arrests or cites someone for one of these violations the state must prosecute under a specific statute number, as there is no general law. On the other hand the penalties upon conviction are almost identical for all the different variations. Trespass is a common crime, and although it is considered a minor or petty offense, the penalty for a first time offender is still up to 90 days in jail. A defendant who is convicted a second time within two years face up to 6 months in jail, and subsequent convictions after the second one carry up to a year in jail. One of the most common types is trespass on posted property. A violation occurs when a person enters property that has visible no trespassing signs on posts or trees. The signs must not only be visible, but must be placed in a conspicuous location at all points of entry including road entrances, adjoining land, and adjoining waterways. In some rare cases a person who crosses legally sufficient paint marks, which signal when private property begins, may also be prosecuted. The other common type is wanton trespass on private property, also known as trespass after warning. This offense is pretty self explanatory, and occurs when a property owner or lawful agent tells someone not to return but he or she ignores the request. This offense applies to all types of private property including homes, stores, bars, restaurants, and even boats. Refusing to leave private property after being told to do so is also an action that falls under this statute. This type of offense typically occurs at bars and clubs. We have seen numerous cases where a bouncer or security guard tells a person to leave and he or she refuses, or returns shortly after leaving. A person who is charged with this offense may face disorderly conduct charges as well. There are a few less common types of trespass, and these offenses also have the same maximum 90-day punishment for a first conviction. They include use of a vehicle on private property, use of an off-road vehicle on public property, and wanton entry on cultivated farmland. Another less common type is entry on property for the purpose of invading the privacy of occupants. This particular offense is typically looked upon more harshly than the other types of trespass due to the emphasis that judges and the state place on protecting privacy. No matter which offense that you or a loved one has been charged with it is important to have a skilled and experienced defense attorney in your corner. Benjamin Herbst has defended numerous trespass violations and understands that even this relatively minor charge can have major consequences including a permanent criminal conviction, probation, and even jail time. These charges may also have negative effects on juveniles, who are commonly involved in trespass cases. Benjamin has defended juveniles in this type of case and has experience in the juvenile justice system. Contact Benjamin at The Herbst Firm for a free consultation about your case.